• William W. Bennett, A Narrative of the Great Revival Which Prevailed in the Southern Armies . . . (Philadelphia: Claxton, Remsen & Haffelfinger, 1877). The author, who led the Methodist Soldiers’ Tract Association, describes prayer meetings and conversions. • James Farmer, The Metaphysical Confederacy: James Henley Thornwell and the Synthesis of Southern Values (South Carolina, 1982). Though not exactly a full biography of this important southern leader, the book covers well Thornwell’s role in religion and politics. • Drew Gilpin Faust, “Christian Soldiers: The Meaning of Revivalism in the Confederate Armies.” Journal of Southern History, Vol. 53 (1987). A scholarly examination of religion among the southern troops. • Victor Howard, Religion & the Radical Republican Movement (Kentucky, 1990). A good recent work. • J. William Jones, Christ in the Camp; or, Religion in Lee’s Army (Richmond: J.W. Randolph & English, 1880). A chaplain in the Army of Northern Virginia gives eyewitness accounts of revival. • John R. McKivigan, The War against Proslavery Religion: Abolitionism and the Northern Churches, 1830–1865 (Cornell, 1984). Describes the tumultuous move toward abolition in the North. • Albert J. Raboteau, Slave Religion: The ‘Invisible Institution’ in the Antebellum South (Oxford, 1978). A fine social history. • Gardiner H. Shattuck, Jr., A Shield and a Hiding Place: The Religious Life of the Civil War Armies (Mercer, 1987). 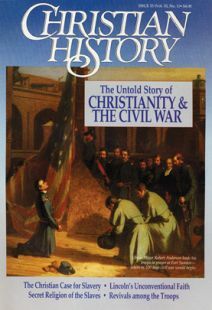 Describes the significant and varied religious experiences of Civil War troops. • William J. Wolf, The Almost Chosen People: A Study of the Religion of Abraham Lincoln (Doubleday, 1959). Still one of the best studies of Lincoln’s religion. Editors’ Bonus Recommendation: For a packet of facsimiles of evangelistic tracts used during the Civil War, send a donation to: Mission for Jesus Christ, P.O. Box 2915, Merrifield, VA 22116. Christian History asked Dr. Charles Reagan Wilson to recommend books that creatively explore Christianity during the Civil War era. Dr. Wilson is professor of history and Southern studies at the Center for the Study of Southern Culture at the University of Mississippi. He is also author of Baptism in Blood: The Religion of the Lost Cause, 1865–1920 (Georgia, 1980).